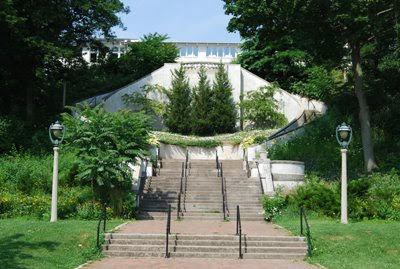 This staircase connects Lincoln Memorial Drive to the Lake Park Bistro. Lake Park was designed by Frederick Law Olmsted, who also designed New York's Central Park. The Park is 124 acres, and includes the North Point Lighthouse, wide open spaces and wooded areas. It is also home to the last Indian burial mound in the city. Where is the Indian Burial Ground? Nice photo. Appreciate the history as well. Near one of the softball fields, nearest Lake Dr. There's a ground sign noting it.